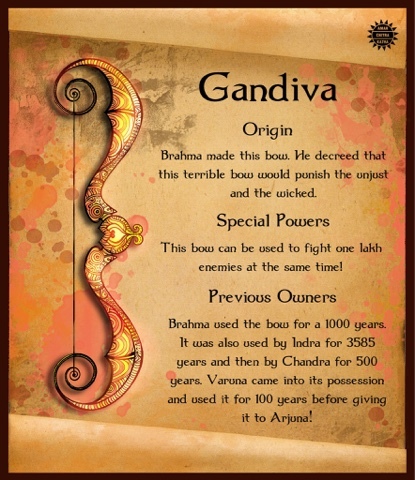 The Gandiva is famous as Arjuna's bow, but what else do you know about it? According to ancient Hindu scriptures, we are in Kali Yuga now and there were three Yugas before. After every Yuga, the world was destroyed and rebuilt. If this is all true (and I believe it is), we have no idea how advanced mankind was in the previous Yugas. What the world is talking about the birth of mankind may be our birth in this Yuga. I agree with you that the highly destructive weapons mentioned in Ramayana and Mahabharata may have been nuclear weapons. What truly happened become stories and myths with time and it also depends on the interpretations of people who are handing it down. Maybe the people who eventually wrote it down did not understand advanced weapons, so they represented them as the weapons they knew, which was bows and arrows. Devika S Parvathy : For the sake of discussion, what if whom we call as aliens are really human beings from previous Yugas who had attained immense technological advances, were able to travel in the cosmos and had migrated to other parts of the Universe, just like what we are trying to do now? What if it is them who have been returning to our planet?